Yahoo, “frankly, could use a little management.” Uttering those words during a conference call to discuss her appointment as CEO, Carol Bartz ushered in a new era at the Internet’s perennial underachiever. If Jerry Yang was a lower-caps CEO–literally, since he pens staff memos using all lowercase letters–Bartz appears to be his ALL CAPS successor, a sacred cow-slaughtering, no-BS strategist. Can she help Yahoo (YHOO) regain its previous stature, or at least turn the company around? Time to find out if we’ll really need that 18-second expletive delay that AT&T CEO Robert Thomson joked about at D7 earlier today. Bartz takes the stage holding a newspaper. “Do you want me to say something naughty now?” she quips. If Yahoo is a starting point, what happens in a world where people are shifting to new starting points, asks Kara. Bartz: People on average visit 85 sites a month, but they really spend time on one or two. And they spend a lot of time on us. They can start on Facebook, but it doesn’t give them what they really want–news, entertainment, etc. Yahoo offers an integrated experience, says Bartz. Does that make you a media company or a tech company, asks Kara. What’s the big issue with that question, says Bartz, who notes that she gets it all the time. We use great technology to deliver search, content, advertising. Bartz says she’s more concerned about the state of the company’s tech products and users’ opinions about them. Kara: “Why did you come to Yahoo? Or rather, why the hell did you come to Yahoo and what did you think of Yahoo when you were first approached to lead the company?” Bartz says Jerry Yang approached her at a board meeting to gauge her interest and she told him to go away. “I’m not the right person.” Kara: Then why did you continue? Bartz says Yang approached her again and she agreed to talk to him, essentially to be cordial. “I said ‘well Jerry, why don’t you draw me an org chart?’ And he pulls an org chart out of the closet and starts drawing Yahoo’s org.” Bartz says she couldn’t believe what she saw. “He drew arrows everywhere. It looked like a Dilbert cartoon.” Yahoo needed some structure, and I’m actually quite good at that, says Bartz. So I took the job. A Quick aside: Former Yahoo CEO Terry Semel and Sue Decker, the company’s former president, are in the audience today. Kara: How do you get changes made in a product at a company like Yahoo? Bartz says it’s frustrating: “There are 33 different code bases for the Yahoo homepage.” Astonishing. Yahoo must drive great integrated experiences for people. So we look at every one of our properties and ask how can we make this better, how can we improve it? We have to get mobile. We have to make mobile as compelling as the PC screen. Kara asks about Yahoo Mail: What do you have to do there? Bartz says many things: We have to make it more simple. She notes that registration is often too complex, especially abroad. Flip side of that: It must also be more customizable. People want new features, a more modern UI and approach. Finally, the inevitable Microsoft (MSFT) question: “What’s going on there?” asks Kara. Bartz jokes a bit about leaving notes in Microsoft CEO Steve Ballmer’s D7 bag, before taking a more serious tone. “If there’s boatloads of money and the right technology involved, would we do a deal? Sure,” says Bartz. “It’s that simple. Not like a big secret what happens when you do a deal. It’s realism.” Would sell for the right money, the right data and technology. So Yahoo is willing to sell search if the money is right and the technology is there? Bartz: “Yes.” What about the whole company? “They’d have to have biiiiig boatloads of money, though.” Are talks between the two companies still going on? Bartz says: a little bit. 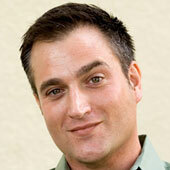 What’s most important for Yahoo: We’re very interested in social, says Bartz. And video as well. “The whole video area is so exciting,” says Bartz, adding that video advertising has grown by leaps and bounds in the past few years. Kara: Do you imagine entering the original content space? Bartz: We are in that space. But, Kara notes, you’re in that space with partners. Bartz concedes. “Would we ever do our own video content,” Bartz asks. She seems skeptical. How is Yahoo faring in the economy? Bartz says that’s obvious. “We are down 13 percent … Down 15 is the new flat,” she quips, adding that the company is doing OK, all things considered. She pulls out a copy of The Wall Street Journal and points out a large Gatorade add on the back page and says that brand advertising like that is destined for Yahoo. Presenting those sorts of messages is something Yahoo does exceptionally well–better even than The Journal. Kara: Are you interested in buying advertising technology? Bartz notes the huge gap in complexity between online and offline ad buys. Online ad buys are maniacally complex, she says. We really need to smooth things out here, reduce transaction time, make it easy. On to Yahoo’s brand-perception issues. Bartz says things aren’t nearly as bad as they’re rumored to be. “People say Yahoo has lost the youth,” she says. “But we haven’t.” She cites a number of stats demonstrating that. Kara wonders if Yahoo needs another charismatic leader, in addition to Bartz–an Internet visionary type to match her business acumen? Bartz says no. “I don’t need a No. 2 because I don’t want to be removed from the business.” My job is to ask questions. Why do I have to know it all? I’m smart enough to ask, “Is that the best you can do?” or “Does that really have to work that way?” It’s a management issue. Kara asks how long Bartz plans to stay at Yahoo. Her contract is for four years, she says. So that long, if not longer. Question about the “Peanut Butter Manifesto.” Does Bartz agree with it? Yes. Bartz says that as that memo pointed out, Yahoo was spread too thin. “We’re taking a very hard look at the portfolio” with an eye toward focusing and improving on the best. What are Yahoo’s most important properties? Bartz: Front page, Search, Mail and News, among others, says Bartz. Bartz says she wants to be able to go through simple steps to personalize the homepage. She does not want to see Britney Spears on her own page. Ask if they are 24 under or over. It should be different in different situations. Question: How do you view Google (GOOG)? Bartz: Google’s a fierce competitor. They’re very good in search, very good in maps. But they don’t have the positioning and reach that we have. We are totally different companies. How we got drafted behind Google, I’m not sure. We are a place people come to be informed. Google is a place people go to do search….We want to be more personal than Google. We are about providing a more integrated experience. We are a different company than Google. Kara jumps in to ask if that means Bartz isn’t committed to holding on to the company’s 20 percent share of the search market. Bartz says it does not. Question about the talent drain at Yahoo? How can the company continue to innovate when it’s losing so much talent? Bartz says she’s not worried about it. “We have a lot of people with smart ideas.” She does, however, concede that some employees may have lost faith. That said, “our employees like to work for us.” And that’s it. 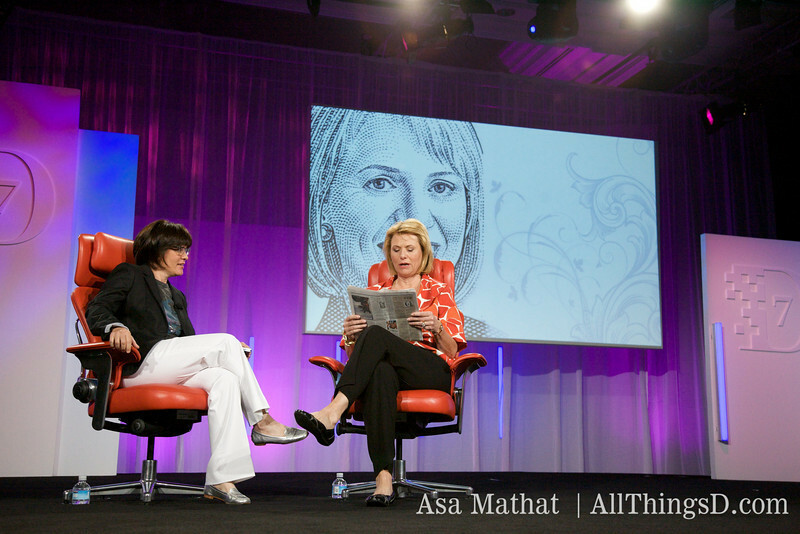 Kara Swisher and Carol Bartz, CEO of Yahoo, review the brand advertising in the Wall Street Journal.